The fall season calls for deliciously irresistible winter squash and butternut squash is one of my all-time favorites. Last night I had the opportunity to hang out with Chef Don Garrett from Wine Country Artisans Catering who made an AMAZING homemade butternut squash ravioli. These raviolis were hands down the BEST butternut squash raviolis I’ve ever tasted (perhaps we will have a blog post soon and Don will share with us his recipe!) Nevertheless, as I was eating his leftovers this afternoon for lunch, I got inspired to whip up something tonight for dinner that incorporated this wonderful autumn squash. 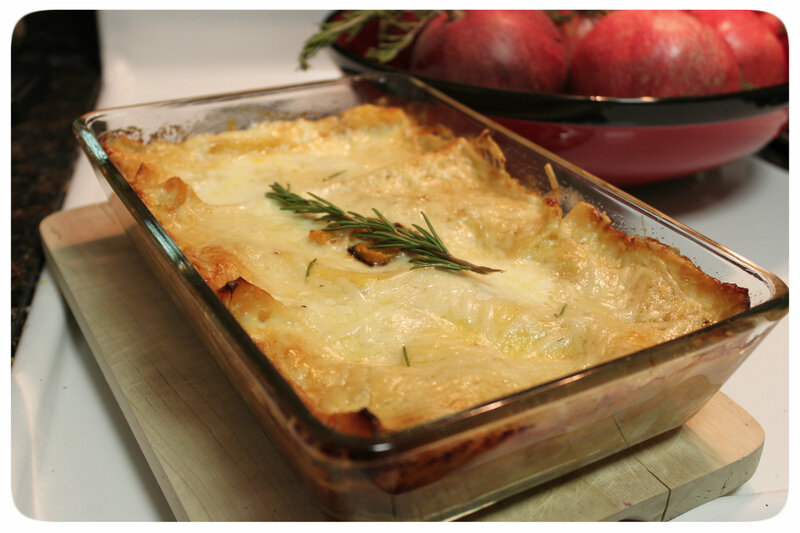 In the past, I’ve made butternut squash soup, roasted squash with thyme and butternut squash risotto… hmmmm, I have lasagna pasta sheets – let’s make lasagna! I haven’t made lasagna in a long, long time so this was the perfect dish to make. Not only is this dish comforting — a perfect pair to the cooler weather — but it’s easy to make. Preheat oven to 450 degrees F. In a large bowl, toss fresh butternut squash pieces with olive oil and lightly season with salt. Roast for 10 minutes. Stir butternut squash and roast for another 10 – 15, until tender and golden. While squash is roasting, melt butter in a large saucepans. Add garlic and cook over medium heat until fragrant (1 minute). Stir in flour and cook roux, stirring for about 2-3 minutes. Slowly add milk, rosemary, salt and pepper. Cook and stir frequently until thickened yet smooth – about 5 – 8 minutes. Stir in roasted squash. Butter a casserole dish and pour some sauce on the bottom of the prepared baking dish. Begin layering the lasagna pasta sheets. Spread the sauce on top of the noodles and sprinkle freshly grated Parmesan cheese. Repeat layering noodles, adding the sauce and finishing with Parmesan cheese. Pour heavy whipping cream over the top of the entire dish and sprinkle a little more cheese. Cover dish tightly with foil and bake in the middle of the oven for 30 minutes. Remove foil and bake for an additional 10 minutes, or until the top is bubbling and golden brown. Allow dish to cool for about 5 minutes. Garnish with rosemary sprigs. Wine Pairing? Try pairing this decadent dish with a rich & buttery Chardonnay. Do you have a personal favorite? Share with us in the comments below or on twitter!